A facelift, or rhytidectomy, is a surgical procedure which is aimed at removing the wrinkles of the skin in order to attain a more youthful appearance. Rhytidectomy is a form of aesthetic surgery and ranks as the sixth most popular aesthetic procedure done in the US. As a person ages, the skin loses much of its elasticity, causing it to sag and become lax. The loss of structural proteins such as collagen, decreased cellular components of the skin, and also the normal wear and tear or other environmental conditions also cause the appearance of wrinkles which contribute to an "aged" appearance. A facelift surgery is able to reduce sagging and wrinkles by changing the underlying structure to make the facial skin taut, in a process similar to inflating a balloon. Facelift surgery may involve only the lower two-thirds of the face (cheeks, jowls or neck). A more comprehensive approach would also address the different areas of the face to achieve a more complete effect, such as the eyelids (blepharoplasty) and brows (browlift). Special procedures such as cheeks malar implantation for the cheeks or chin augmentation may also be done to obtain greater aesthetic results. How is a Facelift done? A facelift surgery is done by making an incision in front of the ear and extending that incision to the hairline above the brow. The skin and the underlying structures of the cheeks and neck are then separated with a scalpel or scissors in a process known as "undermining." 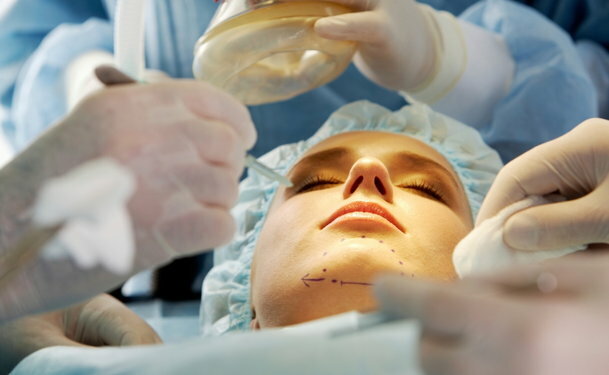 After this is performed, the surgeon then identifies the structures which serve as the suspension system of the face, which is known as the superficial musculoaponeurotic system (SMAS), and tightens them with sutures. When this is finished, the skin is placed once again on the face. Excess skin may be removed from the edges, so that the facial skin is pulled taut when the incisions are closed using sutures or staples. What are the possible complications or side effects of Facelift surgery? The complications involved in facelift surgery include hematoma or bleeding, infection, necrosis of the skin flap, nerve injuries and hypertrophic scarring. Bleeding may occur on the incision site. If the blood accumulates in the tissues under the skin, a hematoma may develop. Infection may set in on the incision site. The process of separating the skin from the deeper tissues may cause injuries to the nerves present in the face. When this happens, partial facial paralysis may occur. Excessive growth of scar tissue on the incision site may cause hypertrophic scarring. Anyone is eligible for facelift surgery unless the person has severe medical conditions such as cardiovascular disease. Facelift surgery is done under general anesthesia, so consultation with a specialist to evaluate a candidate's general health and cardiorespiratory status is warranted prior to the operation. The risk of postoperative complications is particularly high among cigarette smokers and hypertensive patients. Conditions which affect wound healing, such as diabetes, are contraindicated for facelift surgery. Disclaimer: This information is intended only as an introduction to this procedure. This information should not be used to determine whether you will have the procedure performed, nor does it guarantee results of your elective surgery. Further details regarding surgical standards and procedures should be discussed with your physician.